Is that some sort of iPad prototype? Nope, it’s a Newton: the original tablet, or at least the first PDA. 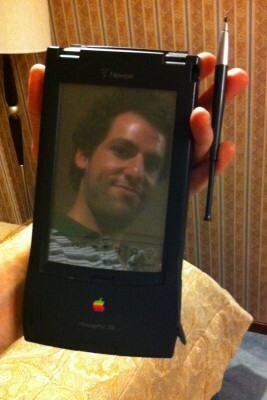 Moi found Jaco‘s first Newton: a MessagePad 120 circa 1992. We took out the old batteries from the Newton and its the external 2400 bps Apple Newton Fax Modem which had luckily not leaked. Plug it in to the wall and voilá! It works, and it still has a bunch of contacts stored from the mid nineties. These things were really, really nice and at least a full decade ahead of their time. That's my reflection, not my photo... the screen is greyscale. Y tu le rompiste la tarjeta del modem que ya no cerraba.